"And still of a winter's night, they say, when the wind is in the trees, When the moon is a ghostly galleon tossed upon cloudy seas, /When the road is a ribbon of moonlight looping the purple moor, A highwayman comes riding, riding, riding, A highwayman comes riding up to the old inn door." 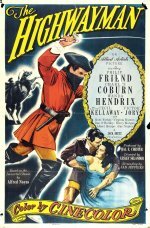 The Highwayman is based on the famous narrative poem by Alfred Noyes. The title character, played by Philip Friend, is a bold masked bandit of 18th-century England, who robs from the rich and gives (a little) to the poor. He is loved by Bess (Wanda Hendrix), the lovely daughter of an innkeeper.